ton duck with vinyl lining. Outside zipper pockets . . Holds 2 dresses. ID tag. ware and zipper closing. Contour edges. Vinyr°lining. Wipe-clean. Shipping weight 2 lbs. 2 oz. 7264H . . . .
LOOK AT THIS: Our lowest price ever for any 3-pc. 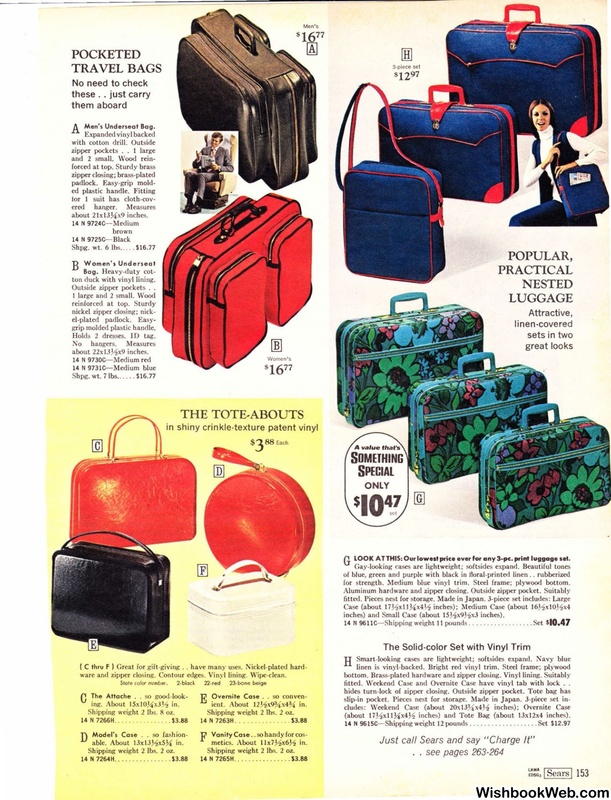 print luggage set. for strength. Medium blue vinyl trim. Steel frame; plywood bottom. inches) and Small Case (about 15Yzx9Yzx3 inches). 9611C- Shipping weight 11 pounds. fitted . Weekend Case and Overnite Case have vinyl tab with lock . .
(about !7Yzx! !Ux4Yz inches) and Tote Bag (about 13x12x4 inches). 9615C- Shipping weight 12 pounds . Just call Sears and say " Charge It"